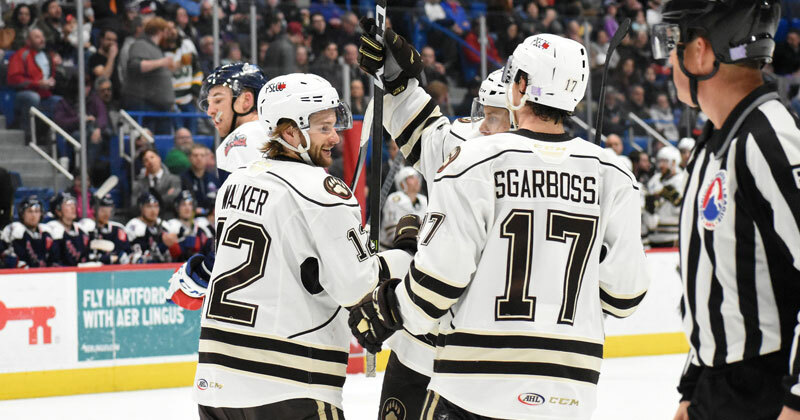 04/12/2019 - Steve Whitney and Nathan Walker tallied a pair of goals to help the Hershey Bears to a commanding 6-3 win over the Hartford Wolf Pack on Friday night at the XL Center. The Bears tallied six goals on the opposition for the fifth time this season, and first since Jan. 5 against the Grand Rapids Griffins. Hershey started the scoring early courtesy of Whitney's eighth goal of the season at 6:51. On a rebound, Whitney found the loose puck in the low-slot and beat Hartford goaltender Brandon Halverson. Only nine seconds later, the Wolf Pack drew even on a sharp angle chance past Vitek Vanecek. Jake Elmer received credit for his first American Hockey League goal after scoring on an offensive zone entry. The Bears went to their first power play at 9:10 of the opening stanza and wasted little time to take advantage. Dylan Steman drew a tripping minor after being hauled down by Ryan Dmowski in the offensive end. Eight seconds after the ensuing offensive zone face-off, Mike Sgarbossa wired his 30th goal of the season, and 15th power play goal to regain Hershey's advantage. The success on the man-advantage continued in the first period at the 14:12 mark. Back on the power play for a second time, Walker redirected a point shot from Aaron Ness to extend the Bears lead to 3-1. Shots after 20 minutes were 14-10 Hartford despite Hershey's two-goal lead. Into the second period, Whitney tallied his second of the game at 7:42 after completing a tic-tac-toe passing play. Beneath the goal line, Joe Snively and Sgarbossa sent a perfect, cross-ice pass for Whitney for the finish. The two-goal performance for Whitney is his first at the AHL level since Apr. 12, 2013 with the Norfolk Admirals. Later in the period, the Bears were tasked with a major penalty kill after Liam O'Brien was assessed a five minute major for charging and a game misconduct. Ville Meskanen brought the Wolf Pack within 4-2 after splitting two defenders with speed and tucking a shot past Vanecek at 13:03. Walker responded for the Chocolate and White at 16:46 to restore Hershey's three-goal lead. In the neutral zone, Walker created a turnover and guided the puck into the offensive end. A centering pass deflected off a defenders skate and into the net for his 16th goal of the season. The fortunate bounce for the Bears ended Halverson's night in goal after yielding five goals on 21 shots. The Bears entered the third period with a 5-2 lead and 23-20 advantage in shots. Elmer added his second goal of the game for Hartford at 1:42, but Ryan Sproul answered for Hershey and rounded out the scoring at 3:07 of the third period. Sproul blasted a shot from the high-slot past Adam Huska after Jayson Megna dropped the puck to an open point. The win concluded Hershey's road schedule for the 2018-19 season with an 18-15-2-3, in addition to securing the team's 41st win of the season. The Hershey Bears return to action on Saturday, Apr. 13 at 7 p.m. The Bears will play host to the Utica Comets to finish a brief, two-game season series. It's Dietz & Watson Ham Shoot Night at Giant Center. All fans are welcome onto the ice post game to take part in the Dietz & Watson Ham Shoot for a chance to win a Holiday Ham. Ticket information is available online at HersheyBears.com.